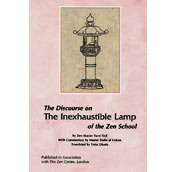 Based on the teachings of the great Zen Master Hakuin Zenji, The Discourse on the Inexhaustible Lamp of the Zen School is an essential guide to Rinzai Zen training. It was written by Torei Enji Zenji (1720-1792), Hakuin's dharma successor. In this book, Master Torei begins by providing a concise history of the Rinzai school and lineage. He then details all the important asBased on the teachings of the great Zen Master Hakuin Zenji, The Discourse on the Inexhaustible Lamp of the Zen School is an essential guide to Rinzai Zen training. It was written by Torei Enji Zenji (1720-1792), Hakuin's dharma successor. In this book, Master Torei begins by providing a concise history of the Rinzai school and lineage. He then details all the important aspects of Zen practice, most notably great faith, great doubt, and great determination. He also provides explanations of koan study and zazen (meditation) as a means of attaining true satori (enlightenment.). This edition includes extensive commentary by Master Daibi, providing both essential background information and clarification of several Buddhist concepts unfamiliar to the general reader. The result is an invaluable record of traditional Zen training.